This year, despite the fact that fall has already arrived, summer has remained for longer than usual. A few days ago, while walking in my Uncle Antonio’s fields, I saw that his pumpkins were continuing to produce flowers and small squash that seem like zucchini. I collected a dozen large flowers and two immature small squash. When I returned home, I thought that if I found some nice fresh shrimp from the supermarket, I could create a nice surprise for my family. They certainly would not expect squash flowers in October. If you do not have a pumpkin or squash patch nearby, I recommend you use zucchini and squash blossoms. 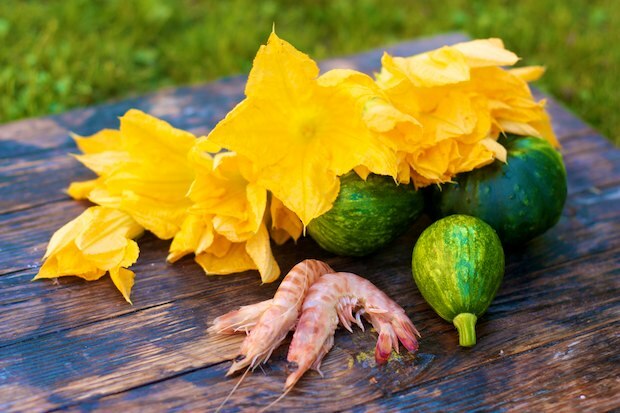 If you can not find them, given the season, the dish will be delicious simply with shrimp and zucchini. In this case, add a few leaves of fresh marjoram. Boil the water with a little salt for the pasta. Shell the shrimp and remove the black trail (intestine), if you have not already purchased cleaned shrimp. 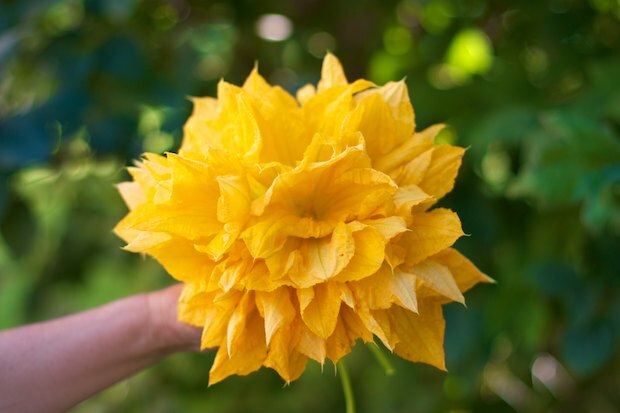 Clean the flowers by removing the stem and the pistil then cut them into thin slices. Cut the squash into thin slices. Add 2 tablespoon of olive oil and garlic to a pan. As soon as it is hot, pour the squash (or zucchini), salt and pepper. Cook for ten minutes, stirring the vegetables occasionally with a silicone spatula. Remove the vegetables from the pan then add butter and when the garlic is golden, add the shrimp. Pour the cognac, flambé, cooking for 5 minutes then add some salt. At this point, add back in the zucchini flowers and zucchini. Meanwhile, the water should have reached a boil, add the pasta and cook according to the directions on the box. When the pasta is cooked, take a ladle of cooking water and add it to the pan with the shrimp and turn on the burner. Add the pasta to the shrimp mixture and mix it for a minute. Serve quickly so that you don’t overcook the pasta. 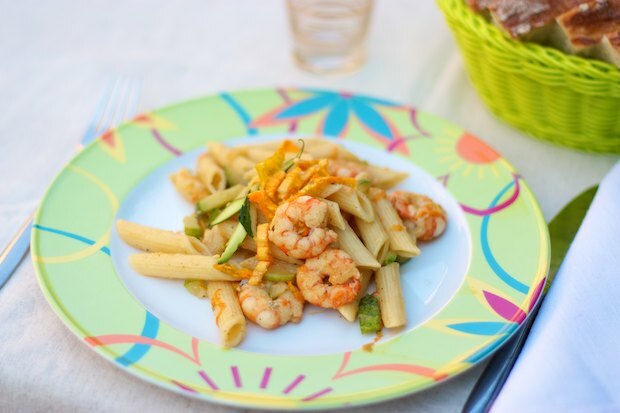 Posted in Pasta and tagged with Penne con Fiori di Zucca e Gamberi, Penne with Squash Blossoms and Shrimp. RSS 2.0 feed.